But not in Richmond. We’ll just have to make do with multiple photos of Anne Hathaway arriving for the New York City premiere. Click here to see them. And here for an interview with Anne in the San Francisco Chronicle. You can catch Anne on Live With Regis and Kelly on Wednesday, August 1. Here’s a trailer of the movie on Yahoo. Click here to enter the PBS site and see a preview of the shows coming in 2008. 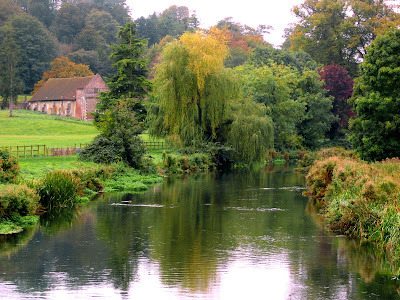 A WalkWith Jane Austen is a lovely book, full of unexpected insights and revelations. Lori Smith’s revealing and personal account is a pure joy to read. As a single, independent and talented woman she is in want of a man, but will not compromise her principles or her quest to experience romantic love in order to simply be with one. Sound familiar? This is one of the many parallels of Lori’s life to Jane’s. However, the one distinct difference between the two women is that Jane lived a geographically circumscribed and rather “eventless” life, whereas Lori is a seasoned world traveler who has embarked on a risky but life-altering journey. 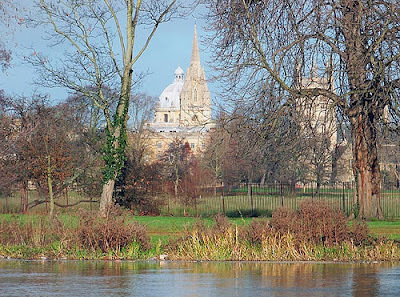 In Part One of this very personal three part account, Lori travels to Oxford. 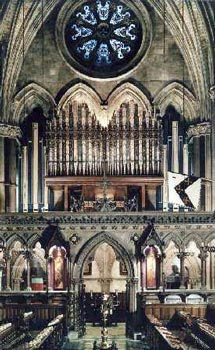 Sitting in a church, she muses about Jane Austen’s faith. As I read Lori’s words, it occurs to me how universally loved Jane has become. Studying the world map sitting on my blog, Jane’s fans live in China, Korea, Italy, South Africa, Chili, Mexico, Canada, Iceland, New Zealand, Bahrain, and of course, all the former British Colonies. How is it that Jane is able to attract a close following from so many countries and faiths? As Lori points out, while Jane is religious and operates from a moral foundation, she was spiritually reserved. “‘She was ‘more inclined to think and act than to talk‘ about her faith.” Lori is so right, and I wonder if Jane’s reserved approach to faith in her novels is one of the reasons she is so universally approachable and loved. In addition to our admiration of Jane’s enormous writing talent, her novels about families, friends, and love gone awry and set right again resonate with people from a variety of backgrounds and religions. At Oxford Lori meets several guys from D.C., one of whom is named Jack. At first impression she likes his easy going humor and affability. And although Jack confesses that he had just begun to see another woman and wasn’t expecting to meet someone else, Lori cautiously and inexorably begins to fall for him. Her analysis of life as a single woman and quest for a man to share her life echo those of many single women. This includes Jane, who also preferred to spend her life single rather than settle on a mate just for the sake of getting married. Part One of the book ends with Lori spending a wonderful evening with Jack and friends, one that is filled with conversation and laughter. Part Two of the journey begins with Lori thinking the whole world beautiful. But I’ll reserve a more detailed analysis of this section for another time. Ever the optimist, I had hoped to review this book chapter by chapter, however my current schedule simply will not allow it. Look for my next synopsis of this wonderful book over the weekend. Within the Austen family there was a preference for using spas for ill health and visiting the seaside for pleasure. 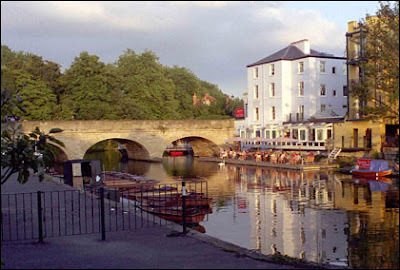 Edward Austen visited and James Leigh-Perrott lived in Bath for treatment of their gout. Jane and Cassandra Austen visited Cheltenham in 1816 to try to cure Jane’s declining health. Their visits to the seaside were planned as recreational visits only, with no specific medical purpose attached to them. It was only the prospect of annual visits to the seaside that made the move to Bath tolerable to Jane. Imagine to yourself a small, snug, wooden chamber, fixed upon a wheel-carriage, having a door at each end, and on each side a little window above, a bench below – The bather, ascending into this apartment by wooden steps, shuts himself in, and begins to undress, while the attendant yokes a horse to the end next the sea, and draws the carriage forwards, till the surface of the water is on a level with the floor of the dressing-room, then he moves and fixes the horse to the other end – The person within being stripped, opens the door to the sea-ward, where he finds the guide ready, and plunges headlong into the water – After having bathed, he re-ascends into the apartment, by the steps which had been shifted for that purpose, and puts on his clothes at his leisure, while the carriage is drawn back again upon the dry land; so that he has nothing further to do, but to open the door, and come down as he went up – Should he be so weak or ill as to require a servant to put off and on his clothes, there is room enough in the apartment for half a dozen people. 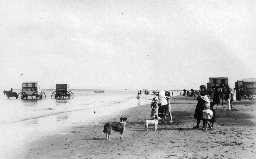 In 1901 it became legal for women and men to bathe on the same seashore (one presumes they are clothed) and bathing machines became less popular. The Truth Revealed: What Do Regency Ladies Really Wear Under Those Thin Yet Elegant Empire Dresses? I found many fascinating facts in the Jane Austen Handbook: A Sensible Yet Elegant Guide to Her World. One that most particularly piqued my interest was that ladies generally did not wear drawers in Jane Austen’s day. I wondered about that statement. Then I viewed the following hand colored etching attributed to Thomas Rowlandson. This caricature depicts the staircase leading to the Great Room at Somerset House in Pall Mall, which was where the members of the Royal Academy exhibited their paintings. The stairway to the Great Room was steep and long, and undoubtedly tough to negotiate during crowded days. Rowlandson’s caricature speaks to the popular perception that there were two kinds of viewers who came to Somerset House: Those who wanted to see the paintings and sculptures, and those who came to ogle the ladies whose legs and ankles were exposed walking up those prominent stairs. 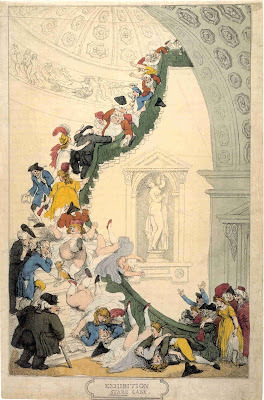 In Rowlandson’s cartoon, the ladies tumble down in a domino effect, revealing much, much more than a neat turn of ankle. I adore the details in this scene: The rakes ready to take their visual fill of the unfortunate situation, while elegant ladies tumble haplessly, limbs akimbo and tender parts exposed. Interestingly, the ladies are wearing stockings but not much more beneath those gauzy muslins. Rowlandson proves Margaret C. Sullivan right and I am happy for it. (Thomas Rowlandson, The Exhibition Stare Case (c. 1811, hand-colored etching; etching may be by Rowlandson, although the coloring is not). 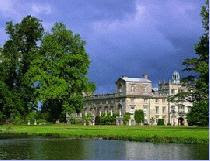 Wilton House, located in Wiltshire, is the ancestral home of the Earls of Pembroke. 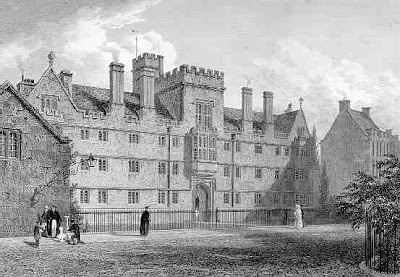 In 1811, Louis Simond wrote about his visit to the great house in An American in Regency England. Here is his description of the park and grounds. 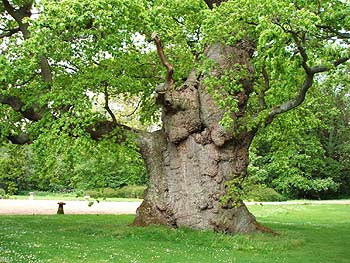 I measured an evergreen oak (not a large tree naturally); it covered a space of seventeen paces in diameter, and the trunk was twelve feet in circumference. An elm was sixteen feet in circumference, and many appeared about equal. Beyond the water, which before it spreads out into a stagnant lake, is a lively stream, you see an insulated hill covered with wood. We went to it by a very beautiful bridge. The view from that eminence is fine, and its slope would have afforded a healthier and pleasanter situation for the house. The deer came to the call, and ate leaves held to them – too tame for beauty, as they lose by it their graceful inquietude and activity and become mere fat cattle for the shambles. 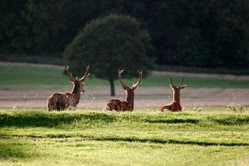 Deer are a good deal out of fashion, and have given way to sheep in many parks. Another of Beau Brummel’s innovations was the semi-starched cravat: a neck cloth folded and arranged exquisitely carefully beneath chin and shirt front. It is reported washerwoman fainted when he introduced this. And no wonder, on top of everything they had to wash, iron, and mend they now had this semi-starched neck cloth: not full starch so it could be done with all the others, no, it had to be semi starched. 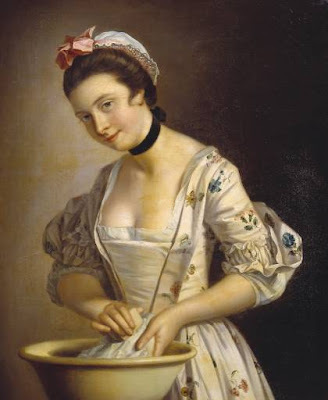 Until recently I would not have singled out this phrase, but as I have been reading about scullery maids (click on link), the enormity of their tasks (and those of washer women and the lowly house maids) have begun to hit me in a real sense. Imagine cleaning dishes or doing laundry in an era when there was no running water piped into the house. The very rich might have a private cistern or well nearby, but for the majority of households during the 19th century and before, water had to be carried into the house from a distance. The town pump or well, while centrally situated in a village or city square, might not be conveniently located near one’s house. In addition to the village well, households in the country could also rely on local streams, rivers, or lakes for their source of water, but again, these bodies of water were probably located some distance away. Whatever the chore, water had to be carried back to the house by the servants of an upper class house or by the mistress or a maid of all work of a modest household. According to Digital History, Washing, boiling and rinsing a single load of laundry used about 50 gallons of water. Over the course of a year she walked 148 miles toting water and carried over 36 tons of water. Homes without running water also lacked the simplest way to dispose garbage: sinks with drains. This meant that women had to remove dirty dishwater, kitchen slops, and, worst of all, the contents of chamberpots from their house by hand. One can just imagine how many buckets of water were required for one hot steaming bath. It is no wonder, then, that people of that era took infrequent baths. In the absence of electric dryers, laundry had to dry naturally. This could be a problem during cold dank winters when clothes took forever to dry. One can now understand why Beau Brummel’s penchant for wearing white, lightly starched cravats (and he often went through a bundle before being satisfied of the results) would make a laundress faint. On Sunday evenings, a housewife soaked clothing in tubs of warm water. When she woke up the next morning, she had to scrub the laundry on a rough washboard and rub it with soap made from lye, which severely irritated her hands. Next, she placed the laundry in big vats of boiling water and stirred the clothes about with a long pole to prevent the clothes from developing yellow spots. Then she lifted the clothes out of the vats with a washstick, rinsed the clothes twice, once in plain water and once with bluing, wrung the clothes out and hung them out to dry. At this point, clothes would be pressed with heavy flatirons and collars would be stiffened with starch. Dyes were not color-fast, and fabrics shrank at different rates. If you read the descriptions of how to wash a “good” dress, the laundress started by removing the trimming and the buttons. Then she separated the lining from the garment itself (picking the seams). If the skirt was full enough that the weight of the wet fabric would cause it to stretch unevenly, she took the skirt off the bodice and took the gores apart at the seams. Then she washed it, dried it, checked to see if the lining and the garment still matched up in size, made any necessary adjustments, and sewed it back together. 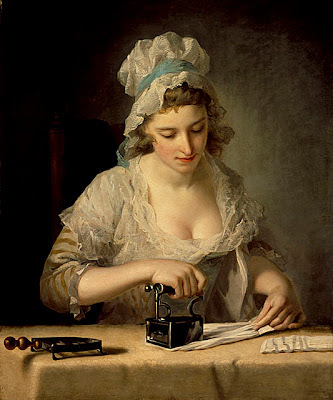 Laundry: Reflections on Early Modern Laundry: This online article explains how laundry techniques hardly changed at all between the 16th and 19th centuries. 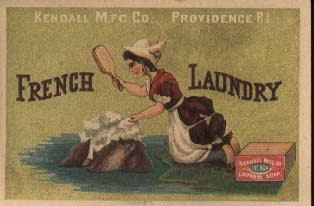 Digital History: Housework in late 19th Century America:Find a detailed description of the 19th century American housewife’s duties on this site. They are not so vastly different than those of the ordinary housewife in England. Victorian Baths: Addresses how cleanliness and hygiene were tackled during the late 19th century. Click on the English Heritage Site for a view of a laundry room.